Unnerving or Ennervating? 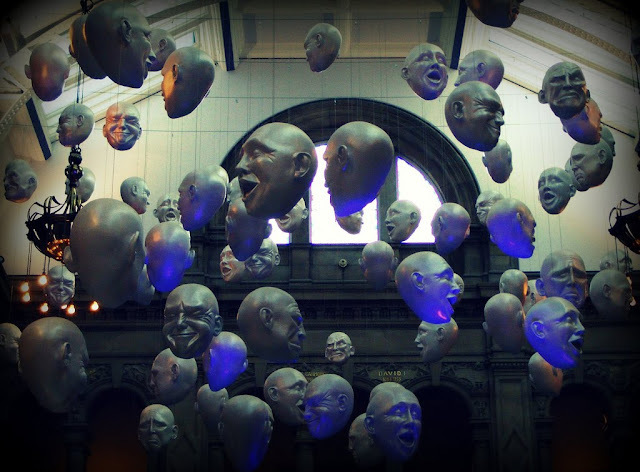 Whatever you may decide, Sophie Cave's Floating Heads is turning many of them. 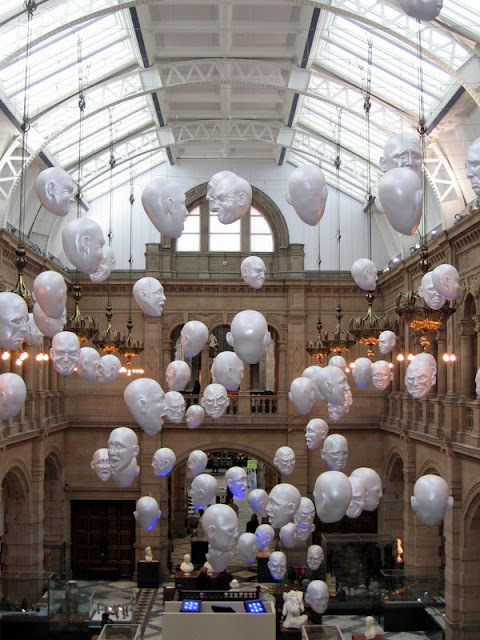 Just about the first thing you notice when you enter the Kelvingrove museum in Glasgow is the heads. 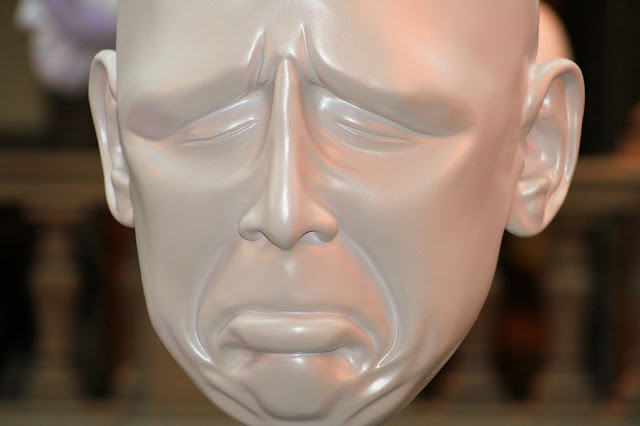 So many heads hanging above your own that they can come as something of a shock. The juxtaposition between the heads and their surroundings an (almost post) Victorian mansion adds to their overall effect. But the reactions to them are just as varied as their expressions. So, what are they doing there? 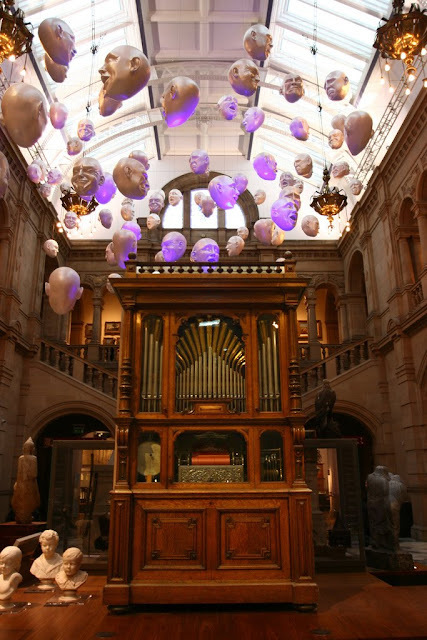 Like all of the best art you are left to make your own mind up about these strange apparitions. Are they perhaps an ironic comment on what people do when they visit museums? 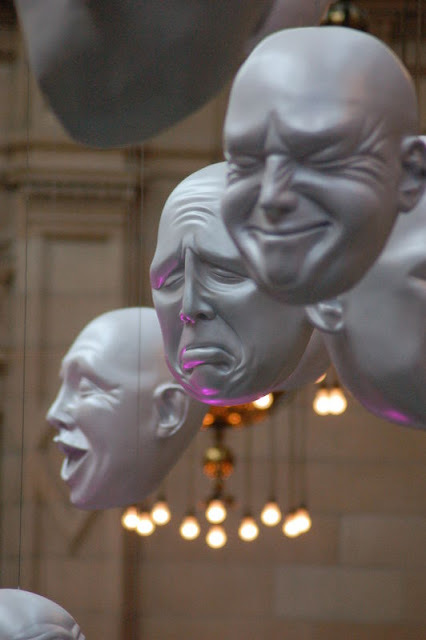 Certainly the variety of reactions the faces elicit themselves are as diverse as the expressions on the faces. Unusual is certainly a word that springs to mind. 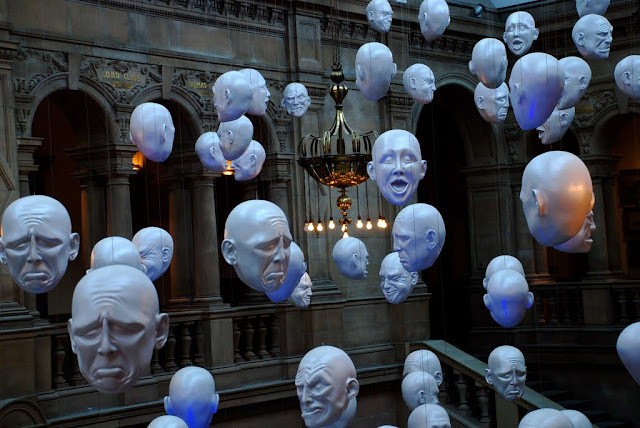 Well, to be honest in this setting one would be unusual – this exhibition by Scottish artist Sophie Cave shows over fifty of the disembodied human faces and they depict a whole gamut of emotions too. 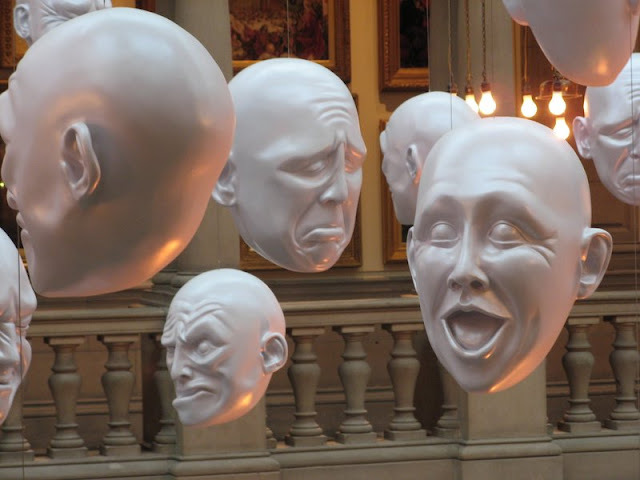 The heads are completely white but are lit so that their expression – that might otherwise be lost to the viewer – are accentuated and gives the installation a sometime eerie (spooky even) feel. The expressions look as if they may change at any minute. 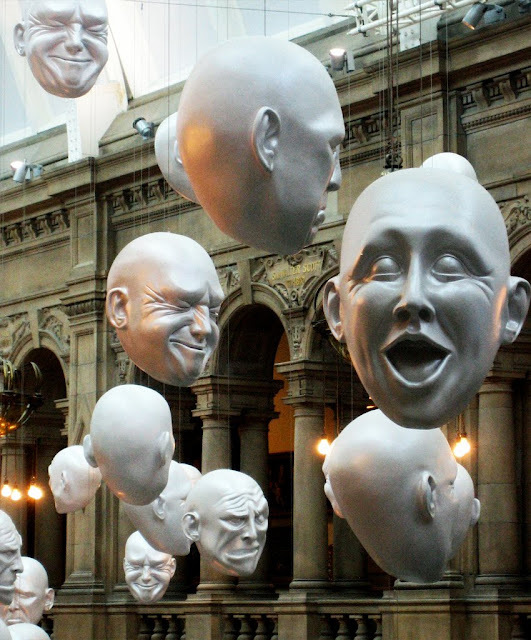 From hilarity to despair the heads together form a captivating (if neck ache inducing) experience. 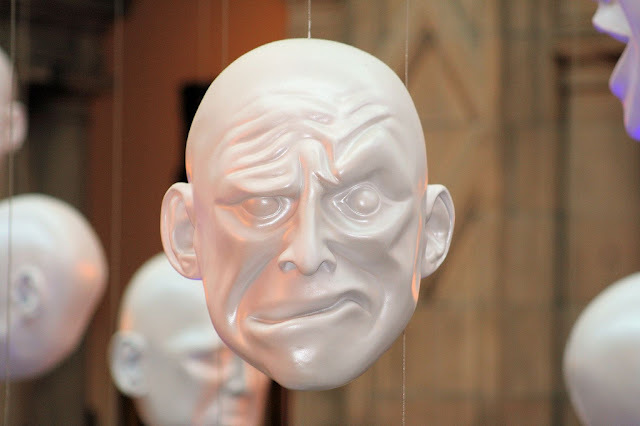 It can easily be seen why so many visitors to the museum find the faces unnerving – even though the eye constantly returns to them – perhaps to check which of the fifty is checking you out! 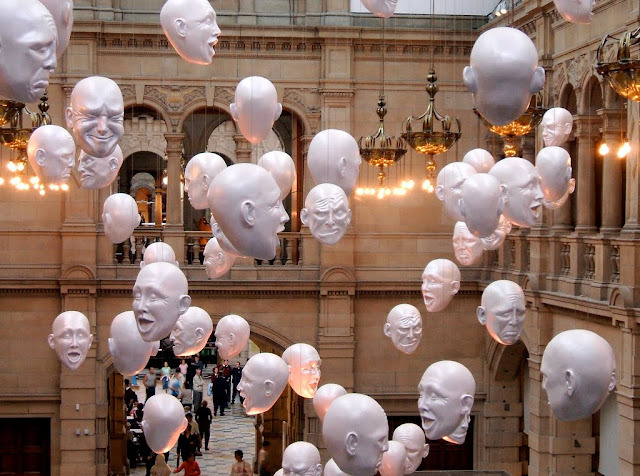 Certainly if you head is always in the clouds, it would be well worth paying a visit to these clouds full of heads.